Requires e-clip & ammo; out of power/ammo on 1 or 2 2. Slow, requires e-clip & ammo; out of power/ammo on 1, 2, or 3 2. Slow, requires e-clip & ammo; out of power/ammo on 1, 2, 3, or 4 2. 1 Half damage from improvised ammunition. 2 Roll 1d6; out of ammo on 1-3, drained e-clip on 4-6. Gauss Needler: The gauss needler is a miniaturized version of the mass-driving rifle, though it still requires two hands to use effectively. It was a common weapon among troops of the North American Combine prior to the Fall. 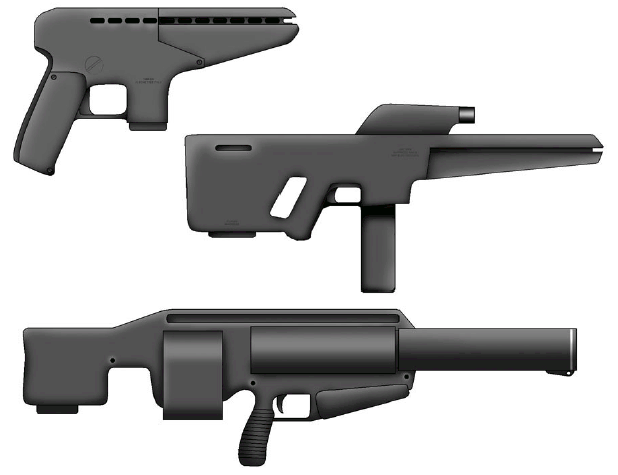 Gauss Battle Rifle: Developed from generations of mass driving weapons, the “modern” gauss rifle incorporates a larger and longer barrel than earlier models (permitting more rails, and thus increased momentum of the flechettes) and more reliable magnetic generators that reduce the risk of instability and explosion to almost nothing. Gauss Auto-Gun: This huge “railgun” is an advanced anti-tank weapon. Primarily used to defeat armour and armoured vehicles, its gauss flechettes pierce armour extraordinarily well. It must be supported by a tripod or mounted on a vehicle to be used effectively. Flechette Ammo: Gauss weapons work best when firing specially-alloyed metal flechettes. Since this ammo can be constructed using Retro-Tech equipment, it is relatively inexpensive. Value: 20 TU. DU Flechettes: Used to overcome heavy armour, flechettes made from depleted uranium (DU) function like a normal projectiles except that they ignore up to 1 point of Damage Resistance when used with a gauss needler, 2 points DR with a gauss rifle, and 3 points DR with a gauss auto-gun. Value: 100 TU. This entry was posted on 20-Nov-11 at 19:37 and is filed under Game Rules, Minimalist with tags Advanced-Tech, Equipment, Post-Apocalyptic, Relics, RPG, Weapons. You can follow any responses to this entry through the RSS 2.0 feed. You can skip to the end and leave a response. Pinging is currently not allowed. Just to be clear about my sources; the majority of the flavour text in this post is taken verbatim from Darwin’s World (from RPGObjects). Variations have also appeared in Mutant Future (from Goblinoid Games). The picture is swiped from Darwin’s World, 2nd edition. You did not mention a gauss pistol, just carbine, battle rifle and auto-gun.